Certain types of breast tumors can send signals that freeze the growth of their own secondary cancers, according to a major new study co-led by Australia's Garvan Institute of Medical Research. The findings, uncovered in mice and patient tumours, are published in Nature Cell Biology today. 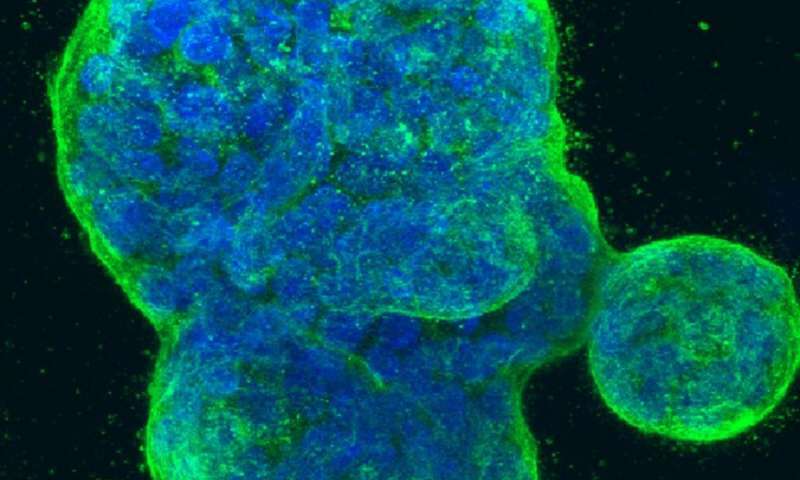 They reveal a previously unseen 'ecosystem' in advanced breast cancer, in which the primary breast tumour emits signals that halt the growth of secondary tumours elsewhere in the body. The spread of cancer beyond the original tumour—known as metastasis—is the most deadly aspect of most cancers. Once a breast cancer has spread to other parts of the body, treatments are far less effective and a patient's prognosis worsens sharply. In Australia, 8 women die from breast cancer every single day1. "This new research has yielded that rare thing," says Dr. Christine Chaffer (Garvan), "- a clue from the cancer itself about new possibilities to fight its spread. Our goal is to work out how we can mimic this 'freezing' of secondary cancers, so that one day we might influence all breast cancers to keep their secondary tumours in check." The researchers found that, in mice, primary breast tumours can influence 'breakaway cells' that have left the primary tumour to establish new tumours throughout the body. The primary tumour sends its message via the immune system, through an 'inflammatory response' provoked by the tumour. Immune cells spread through the body, locating the sites where breakaway cells have settled in preparation for the launch of new secondary tumours. Once the immune cells locate the breakaway cells, remarkably they are able to 'freeze' them—halting tumour growth. "When these breakaway cells are settling, before they have established a new tumour, they are particularly vulnerable," explains Dr. Chaffer, "because they are in an intermediate state, and their identity isn't very solid. It's at this point that the immune system can intervene." "When breakaway cells are forced to remain in the transition state, they don't grow very well," remarks Dr. Sandra McAllister (Brigham and Women's Hospital and Harvard Medical School, Boston), who co-led the research with Dr. Chaffer, "and their ability to form a new tumour is severely compromised. So, remarkably, by activating the immune response, the primary tumour essentially shuts down its own spread." Dr. Chaffer and her lab are now devising how this discovery might be applicable in the clinic. "When you have a primary tumour, there are untold numbers of breakaway cells that will travel throughout the body—but not all of them will form tumours," she says. "By some estimates less than 0.02% of breakaway cells will form secondary tumours2-4- so we have a real opportunity to bring this number down to zero." "We want to understand exactly what the tumour is releasing to activate this immune response, and how immune cells are targeting the secondary sites," concludes Dr. Chaffer. "In principle, all of these steps present therapeutic opportunities that could be used to stop a cancer from developing any further."